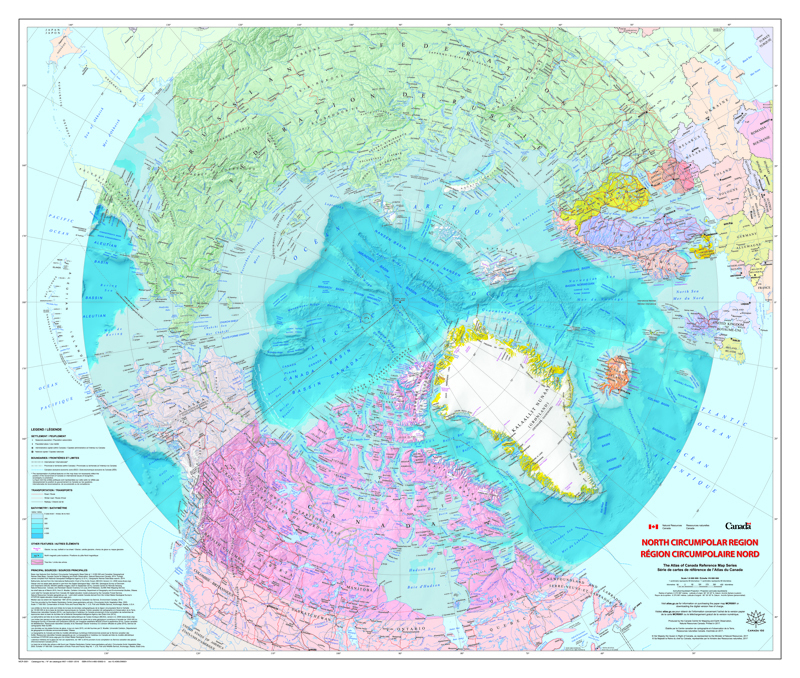 This unique bilingual North Circumpolar Region map is viewed from a different angle then most maps, using the azimuthal equidistant projection with the geographic North Pole serving as the central point of the map. Created at a scale of 1:9 000 000 the map contains detailed geographical information on all Arctic regions (north of approximately 55 degrees latitude), including Canada, Russia, Greenland, Northern European countries, and the state of Alaska.The North Circumpolar Map provides Canadians with a detailed glimpse of our northern geography, including a number of labelled physiographic and hydrographic features. New map features include revised roads and railways, updated glacier data, as well as the introduction of dual names that take into account both European and Indigenous origins. We encourage all Canadians to take advantage of this free high resolution map available for download from NRCAN and help promote a unique perspective of our prodigious nation.